Blessed thistle is an annual found mostly in North Africa, Western Asia and Southern Europe. It grows yellow, prickly flowers. The flowers, leaves and stems are dried and used for pharmaceuticals and homeopathic medicine. Milk thistle is native to Europe, but can be found in North America, Mexico and Canada. It has reddish-purple flowers and prickly leaves. When the leaves or stems are broken, they leak a milky white sap. The seeds of milk thistle are used in capsules, teas and extracts. Blessed thistle was first cultivated in Europe during the Middle Ages. During this time, it was used to treat Bubonic Plague, digestive problems, gout, fever, and headaches. Milk thistle has been used by Europeans for over two-thousand years. It was first used as a herbal treatment for liver disorders. According to LiverSupport.com, "This plant has been known since ancient times; it is a biblical plant." Blessed thistle has been used to increase appetite, assist digestion, stimulate saliva, stimulate gastric juice secretion and stimulate bile flow. It is also has been used as an anti-inflammatory, antioxidant, breast-stimulant and menstrual-flow stimulant. 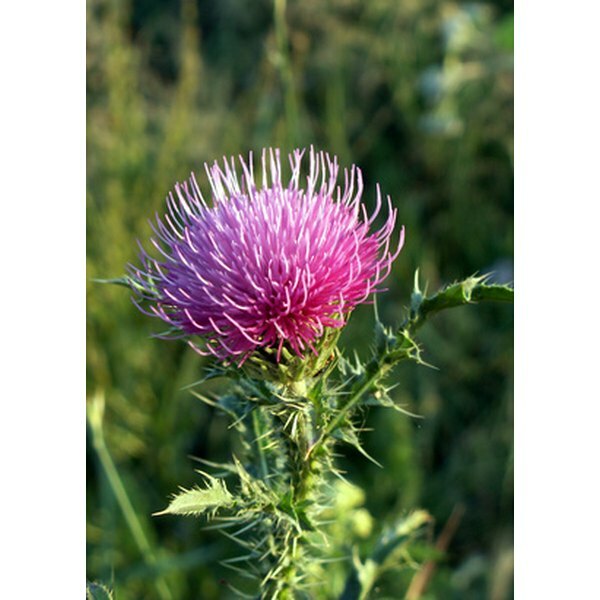 Milk thistle has been used to protect the liver and treat liver cirrhosis, hepatitis and gallbladder disorders. It is also has been used to lower cholesterol, reduce insulin resistance and reduce cancer cell growth of some cancers. High doses of blessed thistle can cause stomach irritation and vomiting. Excessive use may cause liver disease; gastrointestinal and liver problems; and esophageal or nasal cancer. If taken by mouth, blessed thistle can cause irritation of the gastrointestinal tract. Milk thistle can cause indigestion, itching, headaches, heartburn, gas, diarrhea, sexual dysfunction and joint pain. Blessed thistle can be taken in the form of capsules, liquid, infusion or tea. The recommended dosage for capsules is 3 to 4 capsules; three times daily. The dosage for liquid is 10 to 20 drops, or 2 ml, three times daily. The dosage for infusion is 1.5 to 2 gm in 150 ml of water taken orally, three times daily. The dosage for tea is 1.5 to 3 gm of dried blessed thistle boiled in water for 10 to 15 minutes, three times daily. Milk thistle can be taken in the form of capsules, liquid and a tincture (alcohol extract). The recommended dosage is 280 to 450 mg per day. Blessed thistle may interfere with the effectiveness of drugs such as Cimetidine, Famotidine, Zantac and Nizatidine, because it can stimulate stomach acid secretion. Milk thistle may interfere with allergy drugs, anti-anxiety drugs, cancer drugs, blood thinners and drugs for high cholesterol, because these medications and milk thistle are broken down by the same liver enzymes.